Flowering and leaf-bearing stems 3 to 9 inches high, from slender, underground, horizontal, perennial rootstocks which are somewhat woody. Leaves five to nine in number, whorled at the summit of the upright stem, sessile, ovate or obovate, smooth or minutely hairy, pointed at each end, entire, 1 to 4 inches long; the stem sometimes with one or two pairs of smaller, opposite leaves below the whorl. Flowers greenish or yellowish, very small, several in a dense, globose cluster on a stalk one-half to 2 inches long which terminates the stem; the flowers proper surrounded by four to six, usually four, white, petallike, ovate, involucral bracts, one-third to three-fourths of an inch long, so that the entire inflorescence appears at first glance to be a single flower. Fruit a cluster of globose, bright-red berries. In open woods, usually where the soil is moist, sometimes in thickets and on recently cleared land, Newfoundland to Alaska south to New Jersey, West Virginia, Indiana, Colorado and California and in eastern Asia. Flowering in May or June or later in the far north. This dwarf member of a group made up chiefly of large shrubs and trees has been placed in a separate genus by some recent authors, the chief objection to which is its name, Chamaepericlymenum. This generic name has priority over the more appropriate generic name, Cornelia, given it by Doctor Rydberg. 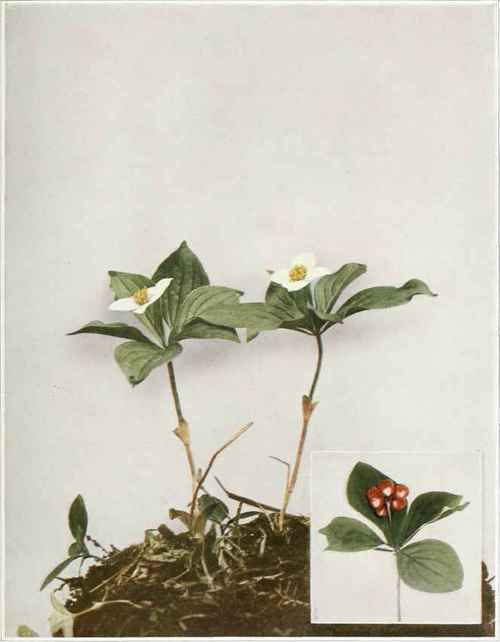 The Flowering Dogwood (Cynoxylon floridum (Linnaeus) Rafinesque) is a small tree or large shrub. The involucral bracts are white or pinkish, obovate and notched at the apex, 1 to 21/2 inches long. Common in the eastern and southern portions of the State.